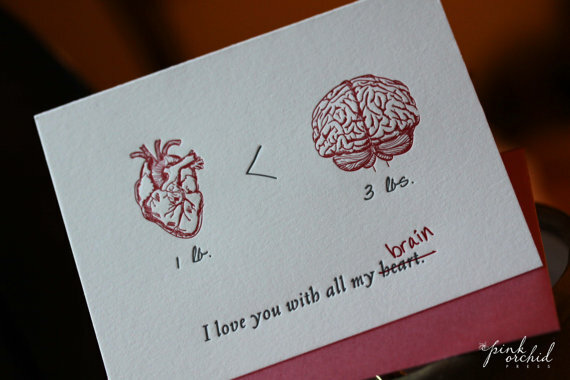 Trial By Sapphire: "I Love You with All My Brain"
I love this card by Pink Orchid Press. Mr. TBS and I don't celebrate Valentine's Day, but the holiday is more fun when you celebrate with your friends and family, anyway. Growing up, my parents would sometimes give us small Valentine's Day gifts. Amidst all the candy, stuffed animals, flowers, and cards from boyfriends over the years, my parents reminded me that the love in a family is worth celebrating too. To each of my "families," thank you for making my life brighter, warmer, and just plain fun! Happy Valentine's Day! I love you guys! Happy Valentines day Lindsay! That card is awesome. That card is WAY awesome! Your blogging family wishes you an amazing happy Valentine's Day as well! I cannot even begin to describe how much I love that Valentine's card! Awesome! That card is hilarious! I find that as I get older, I love all of the holidays, even Valentine's day, more and more. It's a great excuse to remind those closest to you how important they are. Hahaha this card is so YOU. I love you, sis! A WHOLE LOT! I agree...it really is more fun when you spend it with (whoever it is) that you love. I used to be a huge downer on VDday thinking, love should be celebrated every day!! And while it should be, it's so much more fun to actually be excited about something over being down on it! Happy belated V-Day big sis!! I'm so glad that you're in my family! Hi, I'm a new follower :) I don't usually comment too much, but I have to say- that card? AMAZING.